Looking back I probably could have found a more appropriate piece of glassware to use, but alas the beer was poured in a plain old pint glass. The color is that of orange marmalade (even though you can’t really tell by the photo). Apricot highlights appear when held to the light. The head is a pillowy bunch of white foam. Lacing is very plentiful. Even though the smell was muted I was still able to detect several different scents. Apples, white wine, honey and grilled corn were all noticeable. Orange peel was one of the few smells that really jumped out. After the mellowness of the nose I was expecting much the same from the taste, but, boy was I wrong. The wine come through first with a big hint of booze, a malty cracker backbone rounds out the experience. Hints of honey struggle to come through and don’t succeed in every sip. As it warms up (to a more appropriate temperature) it takes on an orange zestiness that tastes like what I think an Orange 7-Up would taste like (if such a thing existed). The booziness also mellows out as the beer nears room temp, creating a more balanced concoction. Just as you would expect by reading the description this beer is light, bubbly and dry in the mouth. As with any white wine, and some Witbiers, there is a residual dryness left behind. 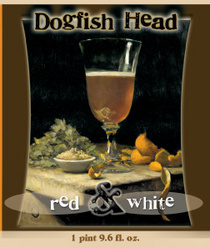 Even though Red & White was good, I don’t think the beer and wine flavors blended as well as I would have liked. It starts with big wine and almost no beer, to big beer and almost no wine. Not really meshing as well as one would hope. 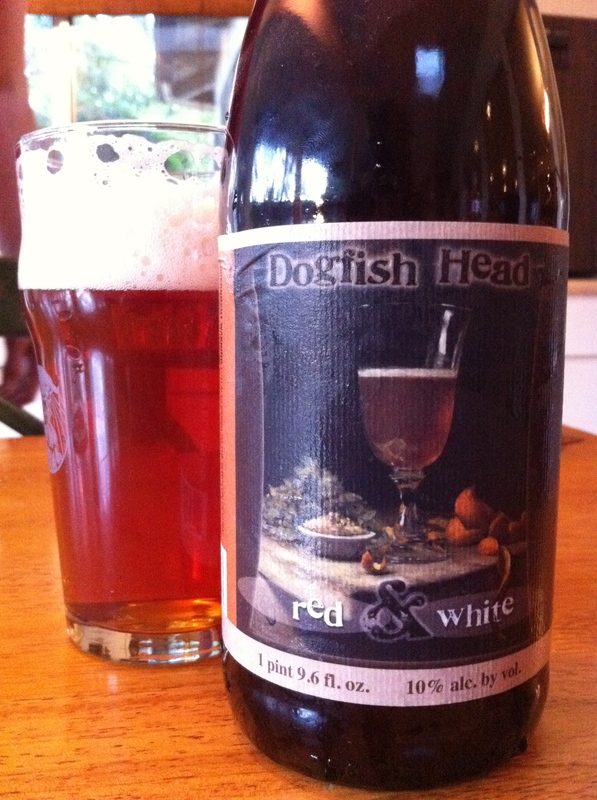 It’s a good beer, but I have a higher standard for Dogfish Head beers and this one didn’t quite make it there.